Q. What are the Cisco Unified IP Phone 7962G and Cisco Unified IP Phone 7942G? A. The Cisco Unified IP Phone 7962G and Cisco Unified IP Phone 7942G are part of a new suite of evolutionary Cisco Unified IP Phone 7900 Series endpoints. They extend the features and functions of the existing Cisco Unified IP Phone 7961G and 7941G models while enhancing the end-user experience with high-fidelity wideband audio and other features. Q. Are the Cisco Unified IP Phone 7962G and Cisco Unified IP Phone 7942G replacing existing phones in the portfolio? A. No. These new phones are additions to the expansive Cisco IP endpoints portfolio. Q. What are the main differences between the Cisco Unified IP Phone 7962G and Cisco Unified IP Phone 7942G versus the Cisco Unified IP Phone 7961G and Cisco Unified IP Phone 7941G? Which phone should I order? A. Refer to Table 1 for the primary differences. * Cisco does not offer the headset; you must purchase it separately. The wideband handset on Cisco Unified IP Phone 7961G and Cisco Unified IP Phone 7941G is available as an accessory only; it is not shipped by default with the phone. Q. What phone firmware version is required? A. A new phone firmware version is required for the Cisco Unified IP Phone 7962G and Cisco Unified IP Phone 7942G. Skinny Client Control Protocol (SCCP) or Session Initiation Protocol (SIP) firmware Version 8.3(2) at minimum is required. Cisco recommends use of the latest posted version of firmware to take advantage of ongoing product enhancements. Q. Is this truly new firmware, or is the existing base code (for Cisco Unified IP Phone 7961G, 7970G, etc.) used? A. The new firmware uses the base code for the existing Java-based phones. The application software is common across the models, and in general all features supported on the earlier phones will continue to be supported on the Cisco Unified IP Phone 7962G and Cisco Unified IP Phone 7942G. Q. What protocols are supported? A. Both SCCP and SIP (with Cisco call control) are supported. Q. How many languages are supported? A. Language support is tied to call control. With Cisco Unified Communications Manager 7.0, the phones support 48 locales and 37 languages. The latest additions are Estonian, Latvian and Lithuanian. Q. Is there an upgrade program to move from an existing phone to one of the newer phones? A. The regular Cisco Technology Migration Program (TMP) is available. Use the Cisco TMP tool to verify the discount. Q. What new features are supported? Q. What is wideband, and what are the advantages? A. Wideband audio expands the available spectrum for voice communications from the standard public-switched-telephone-network (PSTN) range of approximately 300-3300 Hz to approximately 150-7000 Hz. The increased spectrum and frequency response leads to greater voice clarity, intelligibility, “richness,” and less listener fatigue. Q. What is TIA 920? A. TIA (Telecommunications Industry Association) 920 is a voice-over-IP (VoIP) standard for wideband response. Q. What is the G.722 sampling rate? A. It is 16 kHz. Q. What is the bandwidth requirement for G.722? A. The requirement is 64 kbps – the same requirement as for the G.711 codec. Q. Can I use existing narrowband handsets on the new phones? A. Wideband handsets are the only handsets supported on the new phone models; they are shipped with each new phone model. Q. Will G.711 and G.729 narrowband codecs sound “normal” on the new Cisco Unified IP Phones that have seemingly been designed for wideband? A. Using the wideband handset with narrowband codecs may result in perceived improvements in voice quality compared to when a regular narrowband handset is used. Q. Can I use either wideband or narrowband headsets? A. Yes, you can use either type. For the best possible audio performance, the Wideband Headset setting (Enabled or Disabled) of the phone should correlate with the type of headset used. Q. How can I tell if G.722 is enabled on my phone? -> Media Configuration menu. Refer to the administrative guides for the phone for more details. Q. How can I take advantage of G.722 and the wideband experience? A. For point-to-point (IP phone-to-IP phone) wideband calls over a LAN at a single customer site, both endpoint devices must be enabled to support wideband within Cisco Unified CallManager Version 4.1 or later. For multisite point-to-point wideband calls, the IP gateway must support the G.722 wideband codec. Support in Cisco IP gateways is planned for early 2008. Q. Will XML applications be able to take advantage of the G.722 codec for audio playout? A. Yes. Enhancements to XML service application programming interfaces (APIs) in the Version 8.3(2) phone firmware allow for specification of extended stream attributes such as codec type. This support will be reflected in updates to the Software Development Kit (SDK). A. For point-to-point (IP phone-to-IP phone) wideband calls over a LAN at a single customer site, both endpoint devices must be enabled to support wideband within Cisco Unified CallManager Version 4.1 or later. For multisite point-to-point wideband calls, the IP gateway must support the G.722 wideband codec. Q. Do Cisco voice gateways support wideband/G.722? A. Yes, G.722 is supported with Cisco IOS® Software Release 12.4(20)T and later. Q. Does Cisco voice conferencing support wideband/G.722? A. Voice conferencing is a top application for wideband, because speaker recognition and voice naturalness are enhanced over narrowband. Cisco Unified MeetingPlace® Release 8.0 supports wideband conferencing (using G.722). Q. Does Cisco Unified Communications Manager Express support wideband/G.722? A. Yes. G.722 is supported with Cisco IOS Software Release 12.4(20)T and later. Q. What is Internet low-bit rate codec (iLBC)? A. iLBC is a low-bit rate, narrowband codec that withstands high packet loss. It delivers speech quality better than G.729 and G.723.1 and is resilient against packet loss compared to other low-bit rate codecs. It operates at 13.3 kbps (30-ms frames) and 15.2 kbps (20-ms frames), and delivers substantially better voice quality than other low-bit rate narrowband codecs over congested networks with packet loss. Q. Does Cisco voice conferencing support the iLBC robust codec for packet-loss environments? A. Cisco Unified MeetingPlace Release 8.0 supports iLBC. Q. Do Cisco voice gateways support iLBC? A. Yes, iLBC is supported in Cisco IOS Software Release 12.4(15)T release and later. Q. Does Cisco Unified Communications Manager Express support iLBC? A. Yes, iLBC is supported in Cisco IOS Software Release 12.4(20)T and later. Q. What are the Cisco Unified Communications Manager and phone firmware requirements for use with the iLBC codec? A. iLBC requires Cisco Unified Communications Manager 6.0(1) at a minimum, with phone firmware Version 8.3(2). Q. What are the size and resolution of the displays? A. The Cisco Unified IP Phone 7962G and Cisco Unified IP Phone 7942G feature a 5-inch graphical monochrome display with 4-bit grayscale and 320 x 222 effective pixel resolution. The display also supports localization requiring double-byte Unicode encoding for fonts. Q. Do the Cisco Unified IP Phone 7962G and Cisco Unified IP Phone 7942G support XML services? A. Yes. With an advanced user-interaction model, the Cisco Unified IP Phone 7962G and Cisco Unified IP Phone 7942G can deliver powerful applications and network data to the desktop. This capability allows for the availability of more sophisticated applications at any desktop or other location where the phone is deployed. Q. Are the Cisco Unified IP Phone Expansion Module 7914, Cisco Unified IP Phone Expansion Module 7915 and Cisco Unified IP Phone Expansion Module 7916 supported? A. The Cisco Unified IP Phone Expansion Module 7914, Cisco Unified IP Phone Expansion Module 7915 and Cisco Unified IP Phone Expansion Module 7916 are supported on the Cisco Unified IP Phone 7962G. Up to two expansion modules may be attached. It is not supported on the Cisco Unified IP Phone 7942G. Q. Do the Cisco Unified IP Phone Expansion Module 7914, 7915, and 7916 require separate power? A. A single Cisco Unified IP Phone Expansion Module 7914, Cisco Unified IP Phone Expansion Module 7915 and Cisco Unified IP Phone Expansion Module 7916 works without separate power when the phone is locally powered using a Cisco IP phone external power supply. If two expansion modules are attached when the phone itself is locally powered, a second external power supply must be connected to the AC adapter port on the expansion module closest to the phone. When the phone is powered with inline power (IEEE 802.3af) or midspan power (with a power injector), a power supply must be used when either one or two expansion modules are attached. Q. Do the Cisco Unified IP Phone 7962G and Cisco Unified IP Phone 7942G support Cisco Inline Power? A. Yes. Additionally, the phones support IEEE 802.3af Power over Ethernet (PoE) (Class 2) and Cisco Midspan Power. Q. As Class 2 IEEE devices, do these phones require a continuous draw of 7 watts (standard Class 2 allocation)? A. No. When Cisco Unified IP Phones are connected to common switches such as the Cisco Catalyst® 3560 Series Switches or Cisco Catalyst 3570 Series Switches, the switch can automatically detect the phone type and provide the exact amount of power that the phone needs. The use of Cisco Discovery Protocol provides this greater granularity to the power classification, allowing more accurate reporting of power consumption. The Cisco Unified IP Phone 7962G and 7942G models draw a maximum of 6.3W from a switch. Q. Is there a recommended powering option for these phones? A. No. Powering decisions depend on your environment. You can use the IEEE 802.3af inline power method; alternatively, you can use either the standard Cisco Unified IP Phone external power adapter or the Cisco Unified IP Phone Power Injector for local power. Q. What Cisco Unified Communications Manager release is required for the Cisco Unified IP Phone 7962G and Cisco Unified IP Phone 7942G? A. The Cisco Unified IP Phone 7962G and Cisco Unified IP Phone 7942G require one of the following releases at minimum: Cisco Unified CallManager 4.1(3)sr5b or 4.2(3)sr2b, or Cisco Unified Communications Manager 4.3(1), 5.1(1)b, 5.1(2), or 6.0(1). Q. What Cisco Unified Communications Manager Express release is required for the phones? A. The Cisco Unified IP Phone 7962G and Cisco Unified IP Phone 7942G are first supported by Cisco Unified Communications Manager Express Version 4.1 and Cisco IOS Software Release 12.4(15)T (available now). Q. Is Survivable Remote Site Telephony (SRST) supported? What about Secure SRST? A. Yes, Cisco Unified Communications Manager Express 4.1 supports both. Q. Does the Cisco Smart Business Communications System (Cisco Unified Communications 500 Series for Small Business) support these new phones? A. Yes, the Cisco Smart Business Communications System supports both the Cisco Unified IP Phone 7962G and Cisco Unified IP Phone 7942G. Q. Does Cisco Unified Video Advantage for desktop video conferencing support the new phones? A. Yes, Cisco Unified Video Advantage supports the Cisco Unified IP Phone 7962G and Cisco Unified IP Phone 7942G. Q. Which headsets are compatible and recommended? A. Cisco recommends a wideband headset that can take advantage of the improved voice quality available when used in conjunction with the G.722 codec. Because the new phones feature wideband audio, you should use “noise canceling” (directional) headsets for best performance. Please check with headset vendors for Cisco product compatibility. You should always try headsets in the setting of intended use prior to mass purchase and deployment. Q. When can I order these new phones? A. 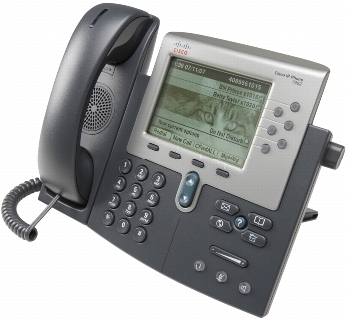 The Cisco Unified IP Phone 7962G and Cisco Unified IP Phone 7942G are now orderable. Q. Are station user licenses or device license units (DLUs) required? A. Yes. As with all Cisco phones, you must purchase a station user license with each phone ordered for use with Cisco Unified CallManager 4.0 and earlier, or for Cisco Unified Communications Manager Express. For Cisco Unified Communications Manager 5.0 and later releases, you must purchase the appropriate device license units. Q. How many device license units (for Cisco Unified Communications Manager 5.0 and later) do I need for the new phones? A. Four device units – the same number required for the Cisco Unified IP Phone 7960 and Cisco Unified IP Phone 7940. In Cisco Unified CallManager 4.0 releases, a phone-specific user license must be configured when ordering the phone. Q. 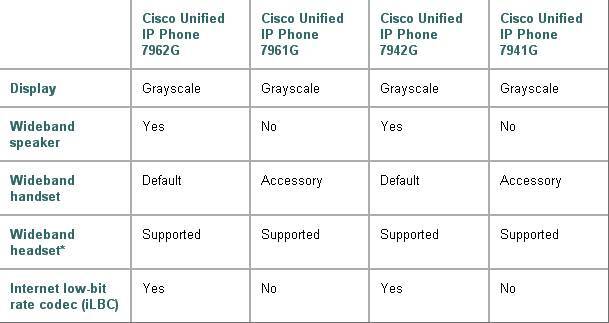 What items are included with a shipped Cisco Unified IP Phone 7962G or Cisco Unified IP Phone 7942G? A. 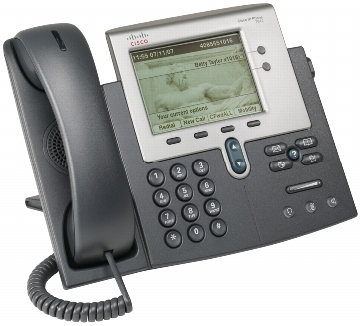 As with the other Cisco Unified IP Phones, these new phones ship with the base unit (with attached foot stand), a handset, a handset cord, a Category 5e Ethernet cord and patch cable, a pictorial quick-start guide, Regulatory Compliance and Safety Information (RSCI), a Cisco 1-year limited hardware warranty card, and an end-user software license agreement.